Alice Wong, Minister of State (Seniors), visited the HelpAge Canada headquarters in Ottawa on June 15 to mark the 10th anniversary of World Elder Abuse Awareness Day. Elder abuse is a serious issue in Canada and around the world. On World Elder Abuse Day, HelpAge International and advocates in 40 countries are bringing attention to elder abuse and the importance of a new UN convention on the rights of older people. We believe this is an important issue for elders around the world. Minister Wong also took the opportunity to announce funding of $25,000 from the New Horizons Seniors Program for HelpAge’s project entitled Seen Your Citizen?–a community-based project dedicated to supporting social participation and inclusion of seniors. Seen Your Citizen? aims to raise awareness of ageism and stereotyping among generations and is one element of HelpAge Canada’s campaign to reduce social isolation among seniors. To view Minster Wong’s press release on World Elder Abuse Day, visit this link. 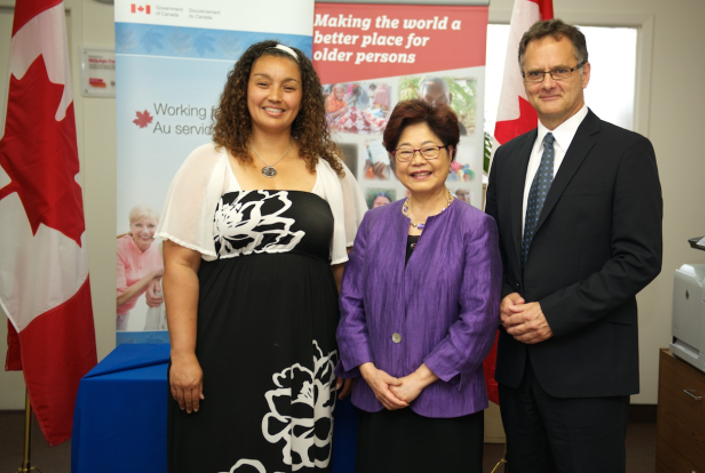 Picture: Natalie Fraser, HelpAge; Minister Alice Wong; Jacques Bertrand, HelpAge Canada Executive Director.